We’re still in the midst of a recession, on the brink of a chaotic and tumultuous presidential race, and held hostage by a stalwart congress. Meanwhile, the people who are protesting and putting a rebellious nation in check for the terrible misdeeds it’s long conducted are being reclassified as national threats. What does this all have to do with an album called The Sounds of Low Class Amerika? It’s been well over seven years since I Self Devine has released anything. But all that changes now, as I Self has provided us with a soundtrack for the desolate times we are experiencing. In I Self Devine fashion, this album proves a lot of things, but above all it showcases I Self’s unbelievable mic presence. He definitely delivers a record that perfectly states what’s going on in any city and the challenges that it faces to meet. Perhaps this is why Amerika succeeds. The producers this go round provide perfectly crafted soundscapes that utilizes sample chops to the utmost degree—definitely well-suited to I Self Devine’s tales of low class America. Producers such as Medium Zach of Big Quarters, DJ Todda, Benzilla, King Karnov, Vitamin D, Jake One, Proh Mic, and even I Self himself deliver a wonderful array of soul, jazz, funk and R&B grooves with snapping snares and thumping kicks. Take a look at songs such as the leadoff single, “The Origin of Urban Crisis,” which features epic, blaring horns; the spacious and airy sampled synths and horns on “Power”; or the Dilla-inspired bounce on “Conditioned.” Throughout the album’s 54 minutes, it’s the sounds that make this album jittery, apocalyptic, and yet provide for a well-told narrative with a sturdy, wonderfully constructed sonic backbone. Speaking of I Self, he’s never lost a step in making sure what he says come across vividly, chilling descriptions that put you in the center of despair. “Exist To Remain” is pretty much on the razor’s edge of “hopeful at times, but ready to go postal,” whereas on “The Origins of Urban Crisis” is all about “just victims caught up in the middle of the system” (it’s about foreclosure issues plaguing most cities). “Power” is about the fight between good and evil, and what lengths one will go to get it. Again, throughout this album, I Self uses descriptions as his tool to express the frustrations of the 99 percent, and it’s a wonderfully told narrative that sees the struggle, no matter how up-close and personal it might be. The Sounds of Low Class Amerika plays a lot like Bob Dylan’s albums: narratives based upon modern day life. While Dylan and I Self are narrators of two different natures, both manage to manifest human struggle and suffering. Throughout their catalogs, their tales of modern-day woes are as vital and urgent as the people’s cries of fairness. Through great struggle comes music that is a reflection of such conditions, and in that way The Sounds of Low Class Amerika is an album for the times we’re in. 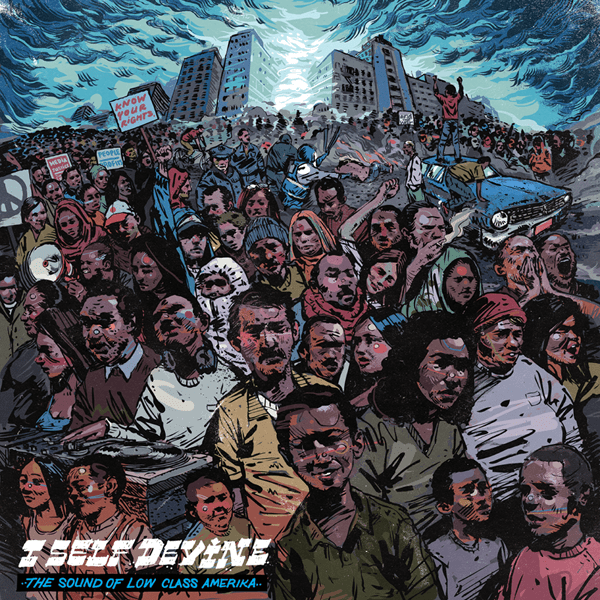 I Self Devine will be celebrating the release of The Sounds of Low Class Amerika on Friday, May 4th at 7th Street Entry. Performing alongside I Self Devine will be I Rule, MaLLy, Audio Perm, Toki Wright, DJ Jimmy2Times and DJ Just 9. Doors are at 8pm for this 18+ event and tickets are $10. On Tuesday, May 8th, from 6pm-8pm I Self Devine will be doing an all ages in-store event at Fifth Element. The rare MC who addresses the world around him with a reality-based narratives. Excited to hear the record, The Sounds Of Low Class Amerika should be hungry, exciting, informative, intelligent and about the PEOPLE. Good lookin Rhymesayers!